Airtel is the finest example we have today to show how a brand can be popular only through its advertisements. 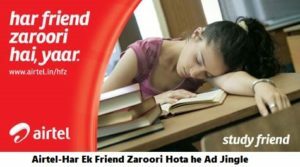 ‘Har ek friend zaroori hota hai’ advertisement is clearly the best Airtel has expressed itself in a long time. The advertisement campaign of Airtel “Har Ek Friend Zaroori Hota Hai” caught the today’s youth sentiments and positioning amongst the brand Airtel in the most vibrant and happening target segment. Ad jingle is really beneficial and most important thing for any company’s branding strategy. You can Listen here Airtel “Har Ek Friend Zaroori Hota hei” Ad Jingle Tune for your Inspiration .While your business may be extremely professional and important, choosing a musical genre that your target audience can attract more attention. The message to music is remembered easily, while Ad jingle that describe what your company does sound like all the rest.